Whenever Audrey and I travel to new or interesting city, we love to take walking tours. They are a great way to gain insight into a city, to learn interesting bits of its history and culture. A walking tour can surprise you with really great information about topics you never considered. In June, we spent 5 days in London. We have been to London before. The primary purpose of this trip was to see The Moody Blues in concert. They were, of course, fantastic. 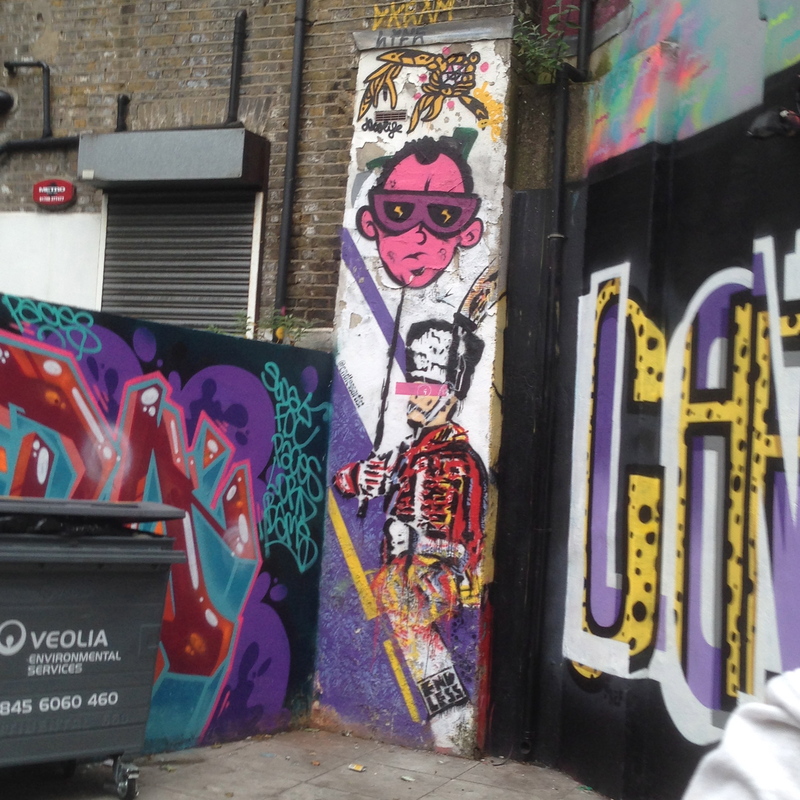 The big surprise of the trip was how much we enjoyed and how much we learned from a walking tour we took – of the street art of London. 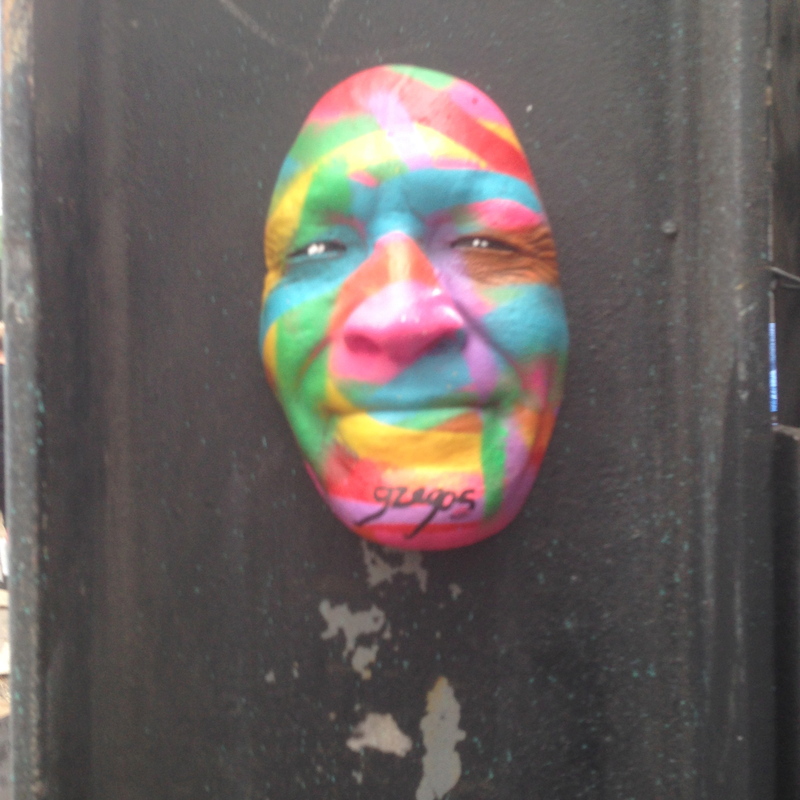 I know what many of you are thinking – street art? Isn’t that just a fancy name for Graffiti? That was exactly what I thought until I took this walking tour. I only knew Graffiti as words and pictures spray painted on the sides of buildings and, in certain cities, subways. I learned there is so much more to Graffiti than that. Street art has many elements I never considered. First, it employs numerous media other than cans of spray paint. Second, it is not random vandalism. Much of it is well thought out social commentary by serious artists. Third, it is a culture that exists internationally. Many street artists travel from city to city, each leaving behind their unique signature or “tag” along with a very creative piece of art. Last, not all street artists are just poor folks expressing outrage at their circumstance. Many have utilized their art and subsequent reputations to become quite successful, even famous – yet sometimes still anonymous! When and where did Graffiti begin? Well, in doing some research I find there is no single agreed upon answer. So I will try to cobble together a history integrating some of the various sources and versions I found. I guess you might say the early cave man engaged in a kind of street art, by producing etchings on the walls of caves – but we cannot know if they secretly contained any political messages. There was some writing on building walls with simple pictures in ancient Rome. 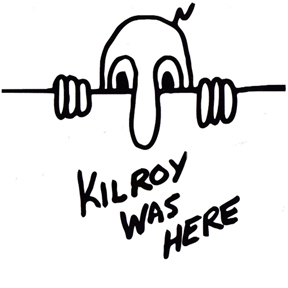 But perhaps we should consider the first real contemporary Graffiti artist was whoever started the “Kilroy was here” craze in World War II. You can see an example of this in the first image on the page I have distributed. There are numerous legends as to who this was. Perhaps it was shipyard inspector James J Kilroy who scratched the words on the bulkheads of ships he inspected. Other legends include a Boston Red Sox fan who became an American GI in World War II. Others say it was a navy admiral. In any case, you probably recognize the drawing that accompanies the words – a long nose and eyes peering over a wall grasped by two hands. Perhaps the first real Graffiti artist was a fellow from North Philadelphia by the name of Darryl MacCray. At age 12 MacCray was sent to a youth development center in Philly, where he earned the nickname “Cornbread.” This youth center was filled with street gang members who would paint their gang names on the walls of the center. MacCray began tagging his name “Cornbread” next to the gang names, thus becoming the first person to tag his own name on walls. He was released from the youth center and attended Strawberry Mansion Junior High, where he developed a crush on a girl named Cynthia. In order to win her affection he began to paint “Cornbread loves Cynthia” all over Philadelphia – thus starting the practice of tagging. In 1971 a Philadelphia youth was killed in gang warfare and the papers incorrectly identified him as Cornbread. Cornbread began tagging “Cornbread Lives” all over Philadelphia, including on the private jet of the Jackson 5 parked at the Philadelphia airport. He was eventually arrested for painting “Cornbread Lives” on an elephant at the Philadelphia Zoo! In the 1970’s Graffiti spread like wildfire to New York – where the subway system became a rolling paint canvas for Graffiti artists. Their work became more and more creative. A famous picture from the film “Saturday Night Fever” shows John Travolta sprawled in a subway seat surrounded by Graffiti. It seemed like the more New York authorities tried to clean up the subways, the more prolific the artists became – and so the more sophisticated their work as well. In 1981 Xavier Prou, using the pseudonym “Blek le Rat” introduced Graffiti with a decided French style to Paris. He was influenced by the Graffiti of New York, but created a different, more European style. He is credited with doing the first full size Graffiti stencils. Some of his work has been preserved in museums, including his gorgeous stencil of a ballerina. Blek le Rat drew his name from the comic book character Blek le Roc, but “rat” was his anagram for “art.” The greatest influence of Blek le Rat, however, was his motivation for doing street art. Much of it was sharp political and social commentary. He also felt that by bringing art to the street, he was bringing it to the people. Indeed, he was arrested in 1991 while stenciling a copy of a famous painting. Today, the street art culture is international, diverse, sophisticated, and still very much rebellious against political and social norms. A number of its participants have become quite successful, quite famous. For example, one of the artists whose work we saw on the streets of London was commissioned by Obama to create a piece for the White House as well has hired by Luis Vuitton to design a line of scarves. However, the most famous, most successful member of the street art culture is Banksy. No one knows who Banksy is. He has never revealed himself or been caught. Yet, by now he must be a multi millionaire. One day Banksy appeared anonymously in Central Park selling small paintings. He sold 3 for 60$ each and signed them. He then posted on his web what he did and that those 3 paintings were 3 authentic, original signed Banksy paintings. Their worth now – $200,000 each! Despite his success, Banksy has not lost his social conscience. Recently, on a water tank on the edge of the Pacific Coast Highway that Banksy thought was abandoned, he painted a caption on the side “This looks a bit like an elephant.” It instantly turned into a tourist attraction. Two owners of a media company decided to turn it into a money making attraction and bought it from the city of Los Angeles, with the idea to sell it for a fortune. However, a homeless person had been living inside of the tank for 7 years. Banksy heard about this and gave the man enough money for an apartment and food for a year. He then removed the water tank from his web site, thus it was no longer authenticated and worth only what it would fetch as scrap metal. His most recent undertaking is in Somerset, England. Banksy invited 60 artists to join him in creating “Dismaland,” a very eerie spoof on Disneyland. Called a “bemusement” park, it is advertised as not appropriate for children. It has just completed a 5 week run in which 4,000 tickets were made available for each day. Local residents were told that an abandoned amusement area in the neighborhood was being used by a Hollywood firm to film a crime movie. Just Google “Dismaland” and you will get an appreciation for the extent of these artists’ work as well as the very sharp social commentary. 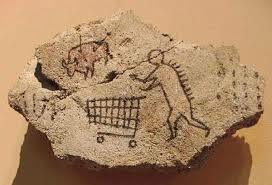 My very favorite Banksy prank, however, is one he pulled on the British Museum in London. He placed his own work in the ancient artifacts section. It took museum officials 3 days to realize it was a fake piece that did not belong there. Here is a picture of that piece. We saw two Banksy works during our walking tour of London street art. Which brings me back to some of the fascinating things we learned on that tour. First, street art is not just random spray painting. It is purposeful, well thought out creations that reflect the perspectives and missions of the artist. That purpose might be social commentary, a political statement, or just to amuse. Indeed, one of the artists whose work we saw says his purpose is just to bring smiles to all who view his work. The picture we saw of his is a whimsical painting of a serious bird watcher with a duck sitting on his head. As I said before, this is an international movement. Some artists travel around the world leaving their signature work in many great cities. One French artist makes impressions of his face, paints them, and places them on walls all over the world. Each mask is made from his face, yet each is different. Here is what we saw. Third, the materials now used are extremely diverse and demonstrate how hard it must be for the artist to get quality work up quickly and in secret. This piece is amazingly impressive as it is done on a rough brick wall. 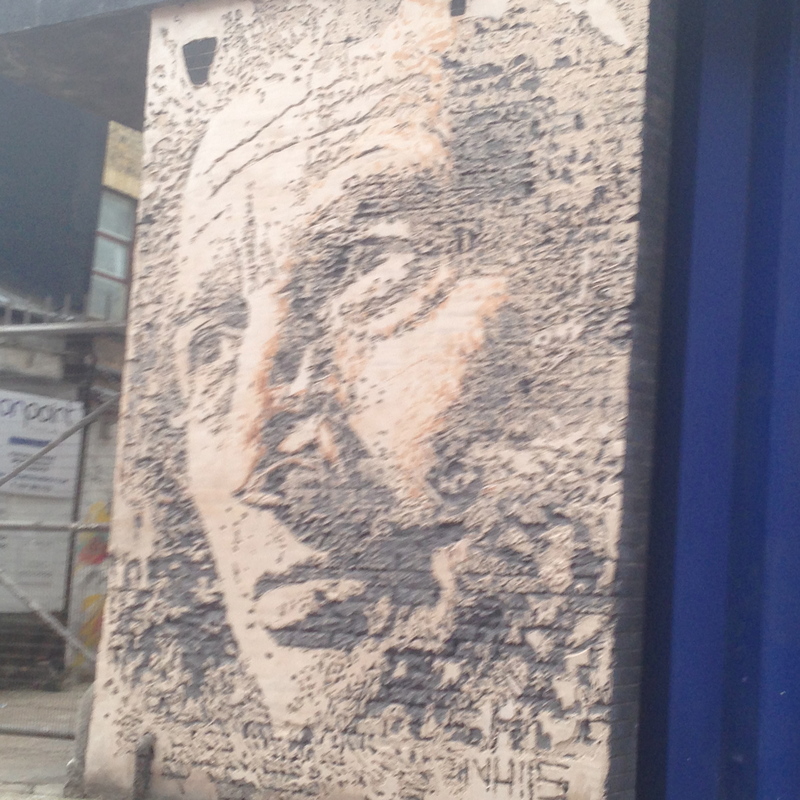 The artist spread a plaster over the wall, then chiseled out the face. That is quite a process yet look how sophisticated the end result is. Finally, despite the beauty of so much of the art we saw, it can all be gone in an instant. Much of the street art is done on abandoned buildings that are about to be torn down. Much of it is on buildings about to be renovated. Much of it is placed in places that irritate municipal authorities, as they have other plans for a neighborhood or building. So the overwhelming percentage of street art just disappears. Yet, I say with admiration, this counter culture continues to grow in extent and sophistication, adding a beautiful spice to the life of the world’s great cities. By now you might be thinking – all of this information about Graffiti is very interesting, but what in the world does it have to do with Yom Kippur? Well, think about this. Some of the street art is amazingly beautiful – yet it will disappear when the building is torn down or the wall is painted over. Some of the street art is an expression of rebellion – yet it will disappear when the building is torn down or the wall is painted over. Some of the street art is poignant insight into life and culture – yet most of it will disappear when the building is torn down or the wall is painted over. Some of the street art is just a mediocre prank – yet it will disappear when the building is torn down or the wall is painted over. Some of the street art can change our perspective on its subject – yet it will disappear when the building is torn down or the wall is painted over. Some of the street art makes us angry – yet it will disappear when the building is torn down or the wall is painted over. Some of the street art will make us happy – yet it will disappear when the building is torn down or the wall is painted over. Some of the street art will make us laugh, some will make us cry, some will prod us to think, some will make no impression at all. All of it will eventually disappear. Yet the street artists keep on creating, keep on sharing their art, their perspectives despite the fact it will likely disappear quickly. My friends, each of us is a piece of street art. Each of us can make another person laugh or cry, angry or pleased, happy or sad. Some of us will make a huge impression on society with the art we call our lives. Some of us will only affect the circle of our family and friends. Some of us are political protesters. Some of us are artists. Some of us just meander through life. Some of us do everything with focused purpose. Yet all of us will disappear. Like the art that is randomly placed on the walls of buildings or the sides of subways, our lives will end – some after a long time, some shorter. Some of us will die by disease, some by accident, some by murder, some tragically, some peacefully. We cannot know our end, but we can know what we are doing in this moment, in the now, with the art that is each of our lives. That, my friends, is Untaneh Tokef – the prayer we recited on Rosh Hashanah and will recite once again tomorrow morning. It is a prayer of fatalism, teaching us that whatever designs we might have for our lives, it can all end in an instant, and in a way we are unlikely to predict. Like the work of street artists, we are temporary creations of the Divine Artist. Unlike the work of the street artists we are deeply aware of our mortality as well as our potential for deep meaning and purpose. So tonight I ask you these questions: are you happy with the work of art you are creating through the actions of your life? Can you accept the reality that one moment you will no longer be here, that your life, like a work of Graffiti will disappear? Are you creating a work of art that might make a lasting impression, a lasting memory? Not necessarily in the sense of being famous, but have you made a difference in another person’s life? For each of us is not only a work of street art created by the Divine Artist; each of us is also an artist, continuing the work begun by God. That is the message of Untaneh Tokef, indeed of the observance of Yom Kippur. To a certain extent our lives are bound to a fatalistic path we do not control. Yet, we can make slight but significant adjustments to our paths. Our prayers tell us this is done through teshuvah, tefillah, utzedakah, repentance, prayer and righteousness. We likely cannot change the hour of our appointed departure from life, but we can change the quality of the time we have. We can improve the artistry of our lives. And we need not do it alone. For unlike the works of art that adorn the sides of buildings and subways, we have the ability to reach out to each other, to help each other, to build community. We might be as diverse as street art, but together we can laugh, cry, celebrate, mourn, confess and pray. Together we create something greater than any of us alone. Despite our differences, we can choose to hold a hand, to embrace in a hug, to share our tallit with the person next to us. We can choose to elevate each other. Uvshofar gadol yitaka – the great shofar is sounded. V’kol d’mamah dakah yishama – yet it is the still small voice that is heard. No matter how loud any of us can speak, in the scheme of life it is but a tiny voice. Each of us is a still small voice. And that voice, well, it is the voice of God, the same voice Elijah heard while alone, contemplating the artistry of his own life. May each of us hear the voice of God in our own still small voices. May each of us be at peace with the artistry of our lives. May each of us take joy in the artistry of the lives of each other. May we turn fear to awe. May we turn anger to celebration. May we all be blessed with a year of shalom, of wholeness, completeness and peace.